Published on May 21, 2012 by Wade Shepard Follow me on Twitter here. There is no way to prevent theft when traveling, all you can do is try whatever you can within reason to deter it. By taking a few precautions to make yourself more difficult to steal from will often leave you unhampered as you move through the world. 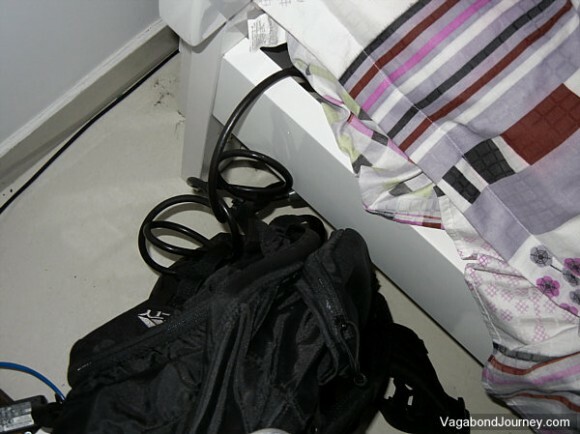 I’ve never had my luggage pilfered in a hotel or hostel in my nearly 13 years of travel. Perhaps this is just the luck of the draw, perhaps my simple precautions are effective. I certainly know a lot of other backpackers who were not so careful and, as could be expected, not as lucky. The object here is not to prevent theft but to deter it. No matter how many locks I have on my bag a kitchen knife or pair of scissors could easily render them moot. The game here is to make your gear more difficult to hit than the next backpackers and to ward off thefts of opportunity. 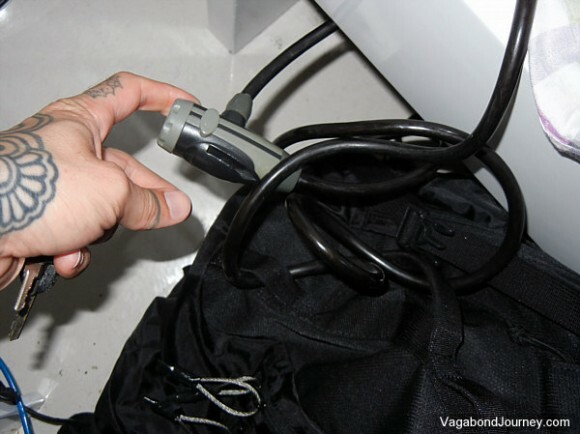 I do this by securely locking my valuables into a backpack, such as I previously demonstrated in the how to make backpack zippers lockable tip. I then weave a standard bicycle lock through the backpack’s daisy chain and handles (sometimes going though the zipper locks as well) and then lock the chain to a secure object in the hotel room. Secure objects include: bed frames, radiator pipes, furniture, pretty much anything you can securely attach your backpack to with a bicycle lock that someone couldn’t break or walk off with easily. Make sure you don’t store your pack too close to a window, and try to find a location that’s as inconspicuous as possible. I repeat that theft in hotels are usually crimes of opportunity: a maid peaks into your bag to see if there’s an easy grab, or another guest in your dorm room goes poking around inside your rucksack with sticky fingers, etc . . . There are generally only three types of people permitted inside of hostels/ hotels: 1) other guests, 2) people that the guests let in, and 3) the hotel/ hostel staff. Unless a group of armed bandits hold up your hotel — it happens — theft is perpetrated by one of these three groups. Most often these thefts are executed quickly and simply upon easy targets and, more often than not, a simple padlock and bicycle lock on a backpack is enough to make all three of these groups pass you over in search of easier prey. Some people have said, “Hey Wade, don’t you think that locking up your bag is sending a signal to a thief that you have expensive things inside of it?” To this question I say, of course. But thieves also know that there are valuables inside your backpack too, regardless if you lock it or not. Not locking up your bag does not mean that someone is going to think that you don’t have anything of value. You’re a backpacker, you are able to come from far away because you have money — everyone knows that you have debit and credit cards, cash, a passport, and, more than likely, expensive electronic devices. Whether you lock your bag up or not is not going to change this fact, but locking up your bag adds a layer of security over it, and makes it a little more difficult for people to pilfer — and this helps deter potential theft. I also don’t use hostel or hotel safes. Why? Because they are not very safe. I’ve stayed in hotels where the safes were robbed or things that were placed in them have gone “missing.” One of the three groups of potential thieves in the hotel setting are the staff members, so it seems pretty stupid to put them in charge of my valuables. I’ve also worked in various hotels and hostels around the world, and I can tell you first hand that those lock boxes are not as secure as you’re led to believe. But I mostly don’t use hotel safes because it’s my responsibility to secure my own gear, not someone else’s. I also don’t recommend pacsafes, as they are just as easy to compromise as a bike lock/ padlock combo and are about twenty times more expensive. They also make you look like a real prig. Why all this worry about theft? I don’t worry about theft. I don’t worry about theft because I have a standard operating procedure that I follow to deter it to an adequate degree. I follow this SOP almost without thought, at this point it’s a banal reaction: when I leave the room, I lock up my stuff. But if my standard operating procedure was beaten by a thief and my backpack was pilfered, it’s not my impression that I would shed many tears. I would be able to rest assured that I did what I could to have deterred the theft, and I would simply replace what was lost. I estimate that I could do a full gear overhaul for $500. I don’t have that much to lose. So I don’t go around the world worrying about being robbed, I follow my SOP to safeguard against theft and forget about it. Being robbed from time to time is part of the great game of world travel, creeping around the planet nervous about loosing your stuff all the time would be a serious buzz kill.